On July 20, 1976, NASA's Viking 1 lander touched down safely on the surface of Mars, revealing an alien world that continues to puzzle scientists and tempt explorers. July 20, 2001: Twenty-five years ago NASA's Viking 1 lander made history by descending from orbit to the surface of Mars. It was the first probe from Earth to land intact on the Red Planet, and the first American spacecraft to land on any world since the Apollo program. 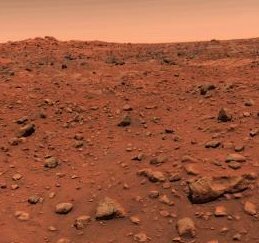 Before Viking 1 touched down many people thought Mars might harbor abundant plant life and microbes living among the rust-colored rocks. Scientists guessed the skies might be tinged deep purple like Earth's stratosphere, which is about as tenuous as the Martian atmosphere. But Viking 1 and its sister ship Viking 2, which arrived on Mars a few months later, quickly dispelled those notions. The landers revealed an alien world with sterile soil and eerie salmon-pink skies. No plants swayed in the breeze. No animals scurried from rock to rock. On the bright side, there were no hostile aliens either. If there was to be a "War of the Worlds" -- like the one popularized by Orson Welle's famous 1938 radio broadcast -- it wouldn't likely begin on Mars! The Viking 1 lander set down on Chryse Planitia, a flood plain at 23 degrees north latitude. "Chryse Planitia is an interesting place," says Jim Garvin, Mars program scientist at NASA Headquarters. "Long ago -- perhaps billions of years -- it was the dumping ground for five wide outflow channels apparently carved by flowing water." Scientists were attracted to it because of its watery history. Viking mission planners liked it because it was flat and seemed to offer a safe landing spot. "[Before Viking], Mars had been examined from orbit by the Mariner spacecraft ... but the images were on the scale of a football field," explains former Viking project manager James Martin of NASA's Langley Research Center. "That was the smallest thing we could see and that's not very distinct when you consider the landers are only six or eight feet across. We didn't have the slightest idea what was on the surface [at such small scales]." Landing anywhere was risky! 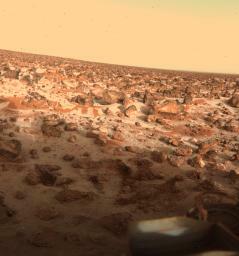 Nevertheless, Viking 1 touched down safely and transmitted its first image 25 seconds later. The lander's seismometer failed to uncage, and a sampler arm locking pin was stuck and took 5 days to shake out. Otherwise, all the experiments functioned as planned. The lander went about its business for more than six years, from July 20, 1976 until November 1982, substantially exceeding its design lifetime of 90 days! 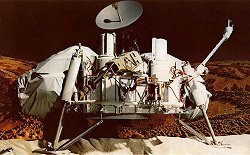 On Sept. 3, 1976, Viking 2 set down at Utopia Planitia -- a gently-sloping plain half a world away from the Viking 1 site (6725 km, to be exact). "Viking 2 landed at 48 degrees north latitude near the Mie crater," says Garvin. "It was a very different environment from the flood plains of Chryse." The weather at Utopia Planitia was different -- a result of its more northern latitude, there were curious pedestals that scientists thought might be small volcanoes, and the terrain was littered with the ejecta of the nearby impact crater. "It was a bold move," says Garvin. Indeed, Viking 2 settled with one leg on a rock tilted at 8 degrees. Nevertheless, the lander performed well for nearly four Earth-years. Mission controllers shut it down on April 11, 1980, after its batteries failed. Working steadily for years, the two landers accumulated 4,500 up-close images of the Martian surface. They also collected more than three million weather-related measurements -- including the first in situ observations of a global Martian dust storm. Meanwhile, two Viking mission orbiters circling high above the planet snapped 52,000 images covering 97 percent of the Martian globe. The Viking landers were successful in so many ways, but they may be remembered best as the first space probes to conduct on-the-spot biological tests for life on another planet. The experiments discovered puzzling chemical activity in scooped-up samples of Martian soil -- but there was no clear evidence of living microorganisms. Perhaps that's not surprising. Garvin explains: "Mars has a thin atmosphere and no global magnetic field, so its surface is constantly bombarded by cosmic rays, solar flares, and harsh ultraviolet (UV) light from the Sun." UV radiation produces oxygen ions at the Martian surface that destroy organic molecules. "The sampling arm on the Viking landers dug down only about 22 cm," says Garvin. That might not have been deep enough to reach the "safe zone" for tiny Martian life. Both of the Viking lander sites were extremely dry desert environments. "Other sites on Mars, such as nearer the polar caps or other places where liquid water may be found, are perhaps more likely places to look for signs of present or past life," speculates Garvin. "Our long-term plans call for missions to find liquid water on or under the surface, which will be the best places to begin looking for signs of life." Since the Viking program, NASA's missions to Mars have included the ill-fated Mars Observer, the successful Mars Pathfinder lander and Sojourner rover, the prolific Mars Global Surveyor (still operating in orbit around Mars), and the Mars Climate Orbiter and Mars Polar Lander -- both of which failed as they neared the Red Planet. The 2001 Mars Odyssey spacecraft is now more than halfway to Mars and is due to arrive there on October 23rd. Operating from orbit, the Odyssey spacecraft will not only search for signs of underground water and interesting surface minerals, but also it will test the radiation environment to learn if Mars is safe for humans. The next pair of landers to visit Mars are scheduled to leave Earth in mid-2003 and to arrive on Mars early the following year. Unlike the Viking landers, however, the 2003 Mars Exploration Rovers won't be confined to their landing sites. The mobile geology laboratories -- each the size of a desk and capable of traveling up to 110 meters a day -- will roam the Martian terrain analyzing rocks and soil. Like most Mars missions, the rovers will begin their interplanetary journey when Earth and Mars are close together. Every 26 months the distance between Earth and Mars shrinks as their orbits bring them together. Astronomers call the time around closest approach "opposition." NASA plans to take advantage of as many Mars oppositions as possible to send probes to the Red Planet roughly every two years. Future missions on the drawing board include longer-lasting and more capable rovers, reconnaissance orbiters -- maybe even Mars-exploring airplanes and balloons. Perhaps one day we humans will go ourselves! And when we arrive we'll find a pair of dusty pioneers already there -- the long-lasting, prolific, but now-silent Viking landers. They blazed the trail for all who followed. Editor's Note: NASA's Langley Research Center was responsible for managing Project Viking until it turned the program over to the Jet Propulsion Laboratory (JPL) in April 1978. Today, JPL manages the NASA Mars Exploration Program, a two-decade-long effort to answer fundamental questions about Mars' early evolution and its ability to support life. The Viking Project was an important milestone in Mars exploration -- but there's even more to the story. Read all about it in "The Earthlings are Coming," an overview of Mars exploration since the days of Galileo Galilei. NASA's Mars Exploration Program -- Learn more about past and future missions to the Red Planet. Planet Gobbling Dust Storms -- An enormous dust storm exploded on Mars three weeks ago, shrouding the planet in haze and raising the temperature of its atmosphere a whopping 30 degrees C.
Unmasking the Face on Mars -- New high-resolution images and 3D altimetry from NASA's Mars Global Surveyor spacecraft reveal the Face on Mars for what it really is: a mesa. A Close Encounter with the Planet Mars -- Earth and Mars are unusually close together. Stargazers won't want to miss the Red Planet blazing bright in the midnight sky. Space Weather on Mars -- Future human explorers of Mars can leave their umbrellas back on Earth, but perhaps they shouldn't forget their Geiger counters! A NASA experiment en route to the Red Planet aims to find out. The Solar Wind at Mars -- The solar wind has slowly eroded the Martian atmosphere for billions of years -- transforming the planet into a barren desert. Carbonated Mars -- Here on Earth the only way to make carbonate rocks is with the aid of liquid water. Finding such rocks on Mars might prove, once and for all, that the barren Red Planet was once warm and wet.